Birthdays may essentially be different from no other days, but at 50 any artist, writer or composer is entitled to pause and reflect on what has been achieved and what may yet be. Although at points during his life Władysław Mirecki may have felt unsure about his accomplishment and apprehensive about his future as a painter, as he surveys the walls of the Chappel Galleries on the occasion of his fiftieth birthday exhibition he need feel no such doubts. Mirecki is established as a highly technically accomplished watercolourist with a strong sense of place. For Waj, as he is widely known, the way ahead has not always been obvious and chance has frequently dictated the route. Early auguries were good. Even as a very small child he demonstrated high intelligence and an awareness of the world around him that would be essential assets for an artist, skills put into good effect at secondary school. Unlike many potential artists, however, Mirecki in his teens remained undecided as to whether he should become a painter or, like his brothers, pursue a scientific career. It was a quandary that would bedevil his time at Kingston Polytechnic, Royal College of Art/Imperial College and various jobs. Not surprisingly, there were periods of depression well into his twenties. A return to his roots at Chelmsford, part-time work at the railway museum at Chappel and Wakes Colne, the discovery of the emerging Chappel Galleries, marriage to Edna Battye their founder and her and Waj’s joint development of the space as an important centre for established and emerging artists – this all contributed to set Mirecki on course to become a serious painter. 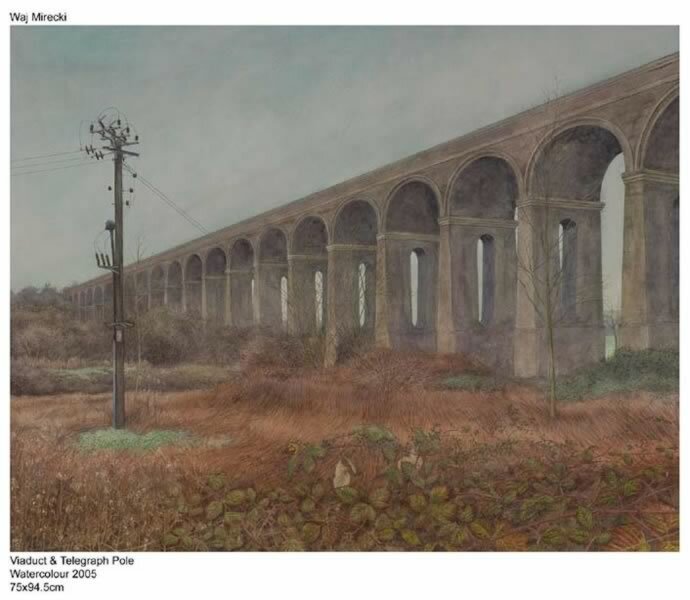 In the Colne Valley and specifically that miracle of Victorian engineering the Chappel viaduct which dominates the view from the gallery, Mirecki found his equivalent to John Constable’s Stour, Samuel Palmer’s Shoreham and Stanley Spencer’s Cookham. Appropriately, when a recent BBC television programme was made about singular features of East Anglia, Mirecki was asked to talk about the viaduct. It features in his current exhibition, but recent years have shown that Mirecki’s horizons are not limited to it and that his work already has international appeal. A pleasing aspect of his last solo exhibition at the Chappel Galleries, in 2003, was a new group of works based on views of the Essex, Suffolk and Norfolk coastlines. In 1999, he was invited to have a solo show at Jiangsu Provincial Art Gallery, in Nanjing, China, where it and the Jiangsu Province Department of Culture acquired his work and it received wide popular acclaim. What he saw there, and the constant interaction with artists showing at the Chappel Galleries have undoubtedly nourished his own work. Fundamentally, however, Mirecki remains a selftaught, self-directed painter. Skills are often hard-won for such autodidacts. Among the benefits are that they develop as individuals, not mere clones of a one teacher or a straightjacket college tradition. Mirecki at 50 is very much his own man, and how he develops will be fascinating to observe. Born Chelmsford, Essex 1956, of Polish parentage. He is self-taught, having painted all his life including his periods gaining his science degree, as an industrial designer and co-proprietor of Chappel Galleries.